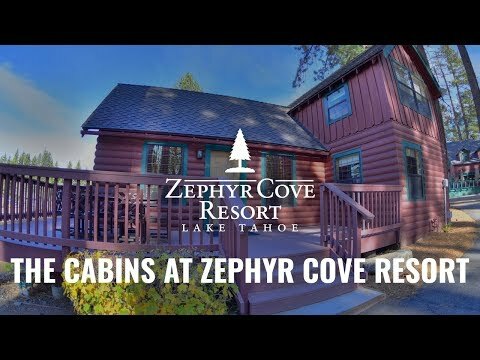 Zephyr Cove Resort offers a delightful natural setting in South Lake Tahoe with 28 cabins and 4 guests rooms. A few minutes walk to our beach, marina, lake cruises and restaurant, Zephyr Cove Resort is perfect for your South Lake Tahoe vacation. Download our convenient, printable map to help you get the lay of the land and discover how to get the most from our entertainment-packed resort. All of our cabins have been carefully renovated to retain their original charm, yet offer modern conveniences. Historic Zephyr Cove Lodge offers 4 comfortable guest rooms accommodating from 2 to 6 guests. Reservations canceled or changed outside of 48 hours from arrival date are a $20 cancellation fee. Reservations canceled or changed inside 48 hours of arrival date forfeit the 1st night's deposit. While there is no man-made pool at the resort, the Lake is at it's warmest in July and August and a wonderful place to swim! Pets are allowed in all cabins. There is a $20 charge per pet per night - 2 Pet Maximum (non-refundable). Additional excessive cleaning fees sill apply when needed. Pets are prohibited in Lodge Rooms. NOTE: Pets are not allowed on Zephyr Cove Beach. However the USFS land is directly next to our property and if the guests take their dog there, they will not be regulated. All indoor facilities including guest rooms and cabins at the property are non-smoking. Violating this policy may result in $300 fine. Smoking is permitted outside at designated areas.